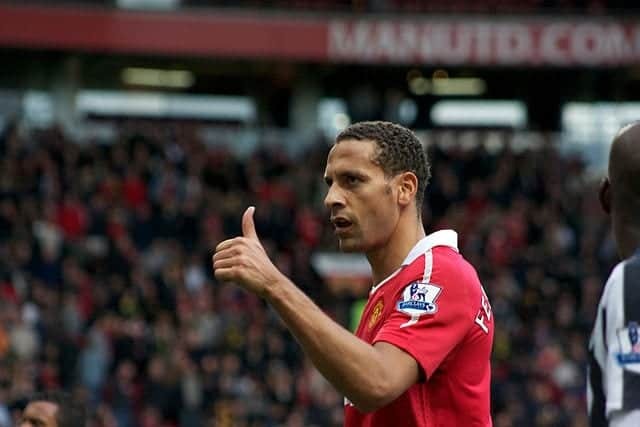 Rio Ferdinand has joined former England football stars David Beckham and John Barnes to announce he will be voting for the UK to remain in the EU today. “Thursday will be the first time I’ve ever been motivated to vote in an election. That’s how seriously I’m taking this. Because the question about our future in Europe isn’t about Conservative versus Labour; it’s not about which bunch of politicians we want running the country. It’s much bigger than that. It’s not about the next five years; it’s about the next fifty. Probably even longer. It’s about the sort of country our kids are going to grow up in, and how the rest of the world will look at Britain from now on. And from all I’ve heard on both sides of this debate, I think our country is at a pretty important fork in the road, and the decision we make could take us to very different places. As for me – for what it’s worth – I am for remaining part of the EU. Some people say this is the unpatriotic choice – that being part of the EU waters down our national identity. To that, I say: come off it. One of the proudest moments of my life was playing for and captaining England – in a shirt I was privileged to wear 81 times. You won’t find many people more patriotic than me – more proud of what this country is about and what we stand for. And for me, there are three simple reasons why, on balance, I think we should remain. The first is my kids. I’ve got three. I teach them that they can achieve anything – that they should dream big. And a lot of the things I’ve heard in this referendum tells me that there’ll be less opportunity for them if we’re out there on our own, pulling up the drawbridge to the rest of the world. I think other countries will just do the same to us. And the rest of the EU is hardly going to give us a great deal for walking out on them, are they? They’ll want to send a message to other countries not to leave as well. It’s just common sense. That means sorting out our new relationship with Europe could take years and years. I don’t know about you, but I think most people have got plans for the next few years. We want to get stuff done; we don’t want to be messing about and having endless Europe discussions. None of that is going to make my kids’ futures brighter; it’ll just make their world smaller. I don’t want that for them. The second reason is that I think that politics is a team game. I worked for the greatest manager of all time. Sir Alex Ferguson always taught us that no individual is bigger than the team; that just because we played for Man United – a massive, famous club – didn’t mean we could swan around doing our own thing. We had to work even harder, and be even more of a team, to get where we wanted to be. And I think Europe is a bit like that. Britain is an amazing country, but we’ll achieve much more if we’re a team player – working with others to get things done. I am a big believer in needing to work with our friends and neighbours in Europe if we want to make a change we and our children can be proud of. The sort of things young people care about: tackling climate change, helping refugees, fighting disease in Africa – they can only get fixed if we all work together. So we shouldn’t cut off our nose to spite our face by walking away. 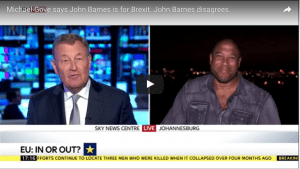 After David Beckham’s intervention, Michael Gove snapped back at reporters that the Leave camp had John Barnes, only for the former England striker to launch an excoriating attack on the immigrant-bashing tone of the Leave campaign. 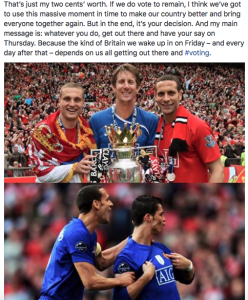 Barnes explained that he had once said English footballers like him would be better off if they needn’t compete with European players for a place on the team – sentiments that the Leave campaign had obviously jumped on, but he championed the benefits of immigration and being part of a Europe that could deal with the big questions together. Which kind of missed the point as independent analysis predictably finds that a Brexit will hit the poorest the worst, whether from jobs leaving the UK for countries still in the common market, prices of European energy and commodities rising or from the predicted austerity that will follow a down-turn in growth. BREAKING: And in an added footie twist, German newspaper Bild says that if Britain votes to remain, Germany will stop disputing Geoff Hurst’s Wembley goal !